Tia Knight is a keyboard artist who serves up an interesting variety of instrumentals on her debut release, from symphonic New Age music to more adventure and sometimes experimental pieces. Standout tracks on the melodic symphonic side include "Raindance", a Medieval New Age gothic electronic track. The harpsichord-like melody is so simple but my head was bopping throughout the song, making it simultaneously dark and uplifting. "Loss" and "Staircase" are symphonic tunes with the later reminding me a lot of Vangelis. 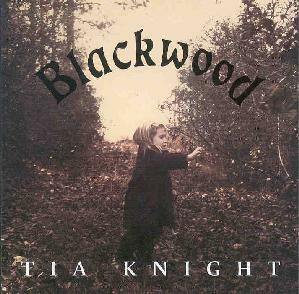 "Blackwood" was one of the more interesting of the New Agey tracks as it had a percussive melody that added character to the music. Things start to get more adventurous with "Vertigo", on which gradually evolving tribal percussion provides the basis for a series of electronic patterns and sounds. It's an intriguing piece because the music demands a little more attention than the other tracks yet still manages to drift along without having jarred the listener from his/her meditation. "Sticks-n-Stones" and "Zodiac" are both harsher, more mechanical atmospheric space ambient pieces. I liked the dark pounding beat on "Zodiac" that conjures up images of a robotic dance. On "Witches Brew" a trumpet sound plays the lead melody against a dark orchestral backdrop while spacey synth noodlings dance about giving the music a welcome freaky edge. And my favorite track is "Bringer", a song the promo sheet says was used in a Frankenstein play at Richland College in Dallas, Texas. The song grabbed me because it actually sounds a bit like "Darkness" from Mr Quimby's Beard's Definitive Unsolved Mysteries Of CD... an analogy that should endear Tia to the space rock crowd. In summary, I can see Tia Knight's music appealing to a variety of listeners, from the New Age fans who like the spiritual element but are sick of the fluff and want something more, to fans of ambient space who like the cooperation and contrast between heavenly symphonics and somewhat more experimental sounds. For more information you can visit Tia Knight at her web site at: http://www.tiaknight.com/. There are loads of full songs to hear at Tia's Mp3.com web site at: http://www.mp3.com/tiaknight. Contact via snail mail c/o Tia Knight; 3039 S. 204th #141; Seattle, WA 98198.